Sweet, approachable, cuddly. Ruger seems like any ordinary dog, but three weeks ago he almost didn't live through the night. Lost, hurt, and starving, Ruger wandered into a woman's garage in Greeneville. She got in touch with Bright Hope Animal Rescue. The group is run by Jason and Amanda Hopson. The couple took Ruger home, but after about four hours they thought he was fading away. "He was cold, he was almost hard, just petting a skeleton with hair on it," said Jason Hopson. 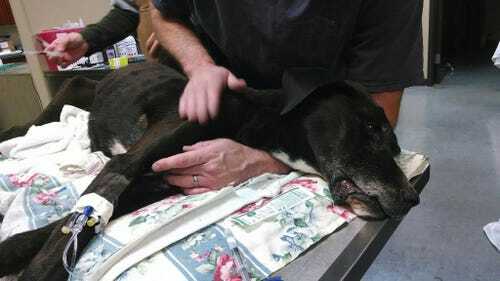 They thought Ruger died in his sleep and at 2:00 a.m., they rushed him to the Animal Medical Center of Greeneville. The center ran multiple test to discover Ruger's stomach had twisted and was beginning to bloat. Ruger had only a 20-percent chance of survival. Doctors Al Claiborne and his father, Ed Claiborne, performed surgery on Ruger to save his life. "He was really a very poor anesthetic and surgical candidate," said Dr. Al Claiborne, "But really came through very well, he's definitely a fighter. " Now Ruger is on his way to becoming a healthy, normal dog. His biggest medical need right now is nutrition. Dr. Claiborne says Ruger is right on track for a healthy weight gain. When he first came to the medical center, Ruger weighed in at 48 pounds. Now he weighs 52.8 pounds. "When we first took him in, he was just a shell of a dog, emotionally and physically," said Jason, "the dog was just broken, had no emotion whatsoever." Ruger is just one of hundreds of dogs the Hopson's have rescued over the years. 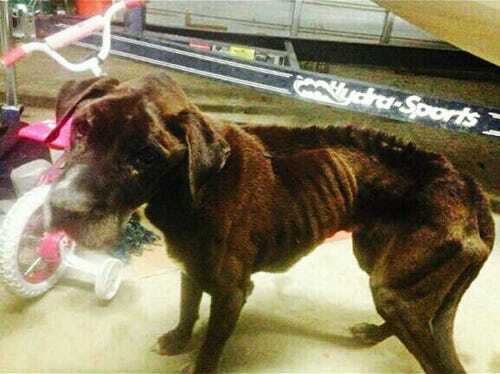 The Hopson's pull abuse and neglect cases and they find dogs that are in imminent danger. Their efforts aren't just local. Bright Hope has traveled to Georgia, South Carolina and even Indiana to retrieve animals. They also travel to the New England area to bring dogs to adopting families. The Hopson's hope Ruger's story will encourage others to do something when they see an animal in need. Jason Hopson believes Ruger wasn't just a wandering stray, he believes his condition comes from months of neglect. "Somebody somewhere saw Ruger before he got to this condition, it could have been avoided months ago." Hopson said. Since his rescue, the Hopson's have seen a blossoming personality in Ruger. "He's starting to follow people, wants hugs, likes to be scratched," said Hopson, "He's just really started to turn around and become a dog again."